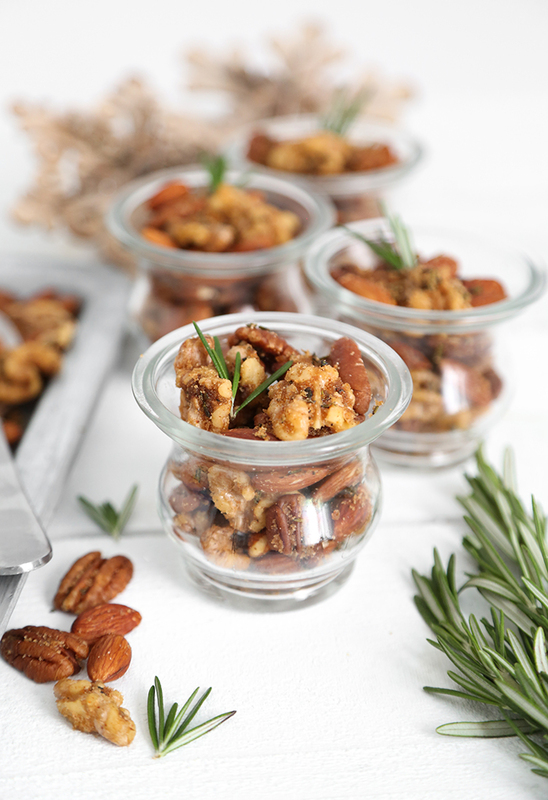 These spicy roasted party nuts are savory-sweet with a coating of brown sugar, sea salt, and chopped fresh rosemary. A dash of ground cayenne pepper makes the flavors zing with just a touch of heat. I had planned to post this recipe during December but - surprise! It's arrived early. I'm putting together a cheese board for Thanksgiving and decided just last night that these spicy nuts would be a perfect addition. The savory-sweet flavors will pair nicely with most any cheese, and I can image a big jarful sitting right next to this filo-wrapped cranberry brie. This recipe takes very little time to put together, which is good news for busy holiday cooks. The flavors of rosemary and cayenne are warm and cozy for cold weather months. I plan to make up a few batches at Christmastime for homemade gifts, and I think they'd be right at home at a New Year's Eve cocktail party. We gave a bag of these to a friend, and upon opening the bag he said "these smell like a pork chop!" which is perhaps my favorite reaction so far! 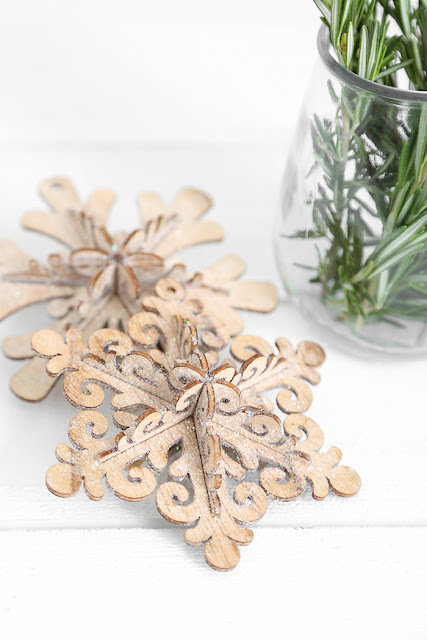 The rosemary is highly fragrant, and the brown sugar is a nice surprise with this savory note. The other element in the dressing for these nuts is oil, which I'm quite picky about. I find that light olive oil is best in this recipe. Its flavor is neutral so the other flavors shine, and it's a heart-healthy fat to boot. I can't wait for my guests to taste these spicy little gems. 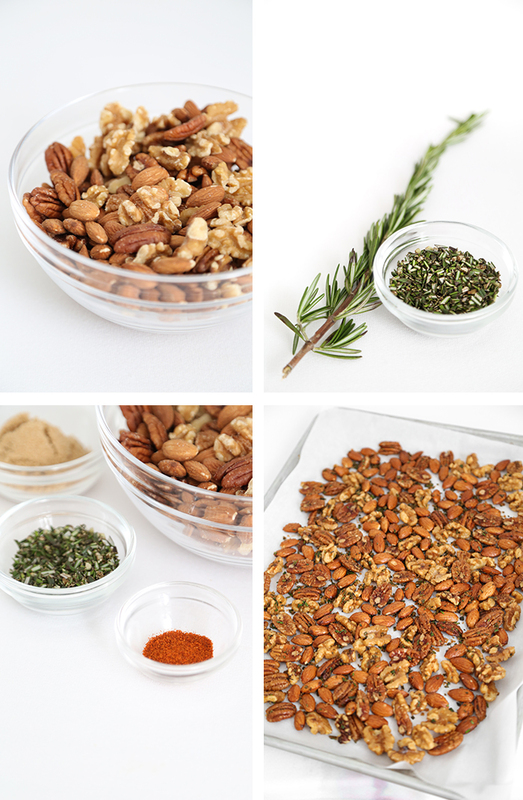 You can use any combination of nuts you like in this recipe, although I like it as-is. For Christmas gift-giving, I purchased these fold-over bakery bags with a window. The interiors are waxed so the oil from the nuts won't seep through the brown paper. I've already used a few of them for other treats, and I find they are quite handy! Place nuts in a large heat proof (metal or glass) bowl. In a saucepan on medium heat, combine the olive oil, rosemary, cayenne pepper, brown sugar and 1/2 teaspoon of salt. Cook briefly until sugar is partially dissolved, stirring until all the ingredients are incorporated. Add the mixture to the nuts and fold together using a rubber spatula. Stir until the nuts are well-coated. 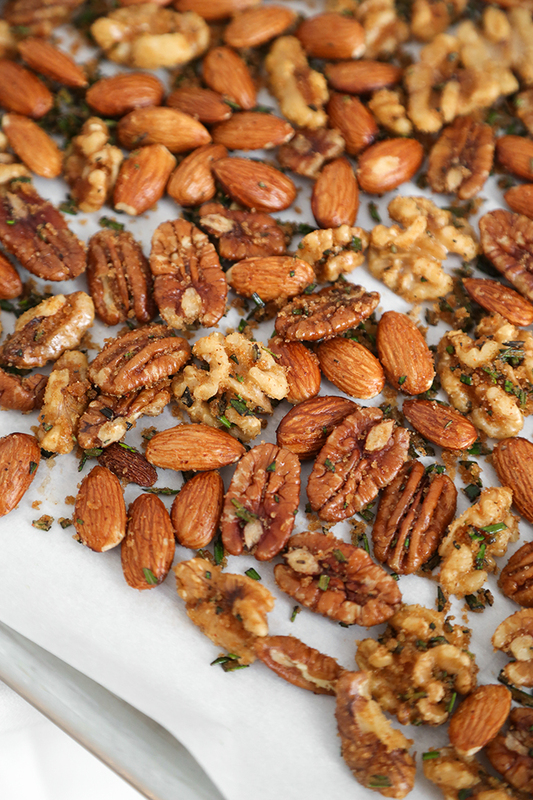 Pour the nuts onto a parchment-lined baking sheet. Bake for 6-10 minutes, stirring halfway through, until roasted and fragrant. Add 2-3 pinches of salt to taste over hot nuts. Serve warm or let cool completely. 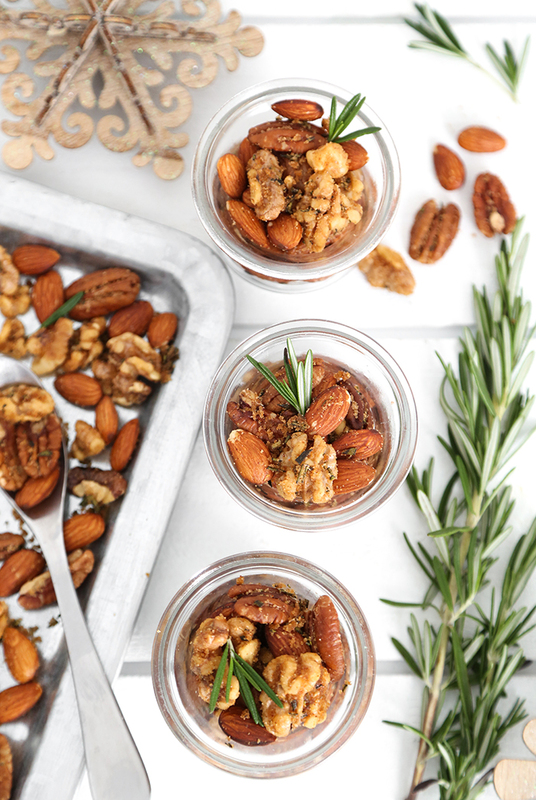 Store the roasted nuts in an airtight container for up to three weeks.